The Yorkshire Party launched its general election manifesto in Wakefield today. 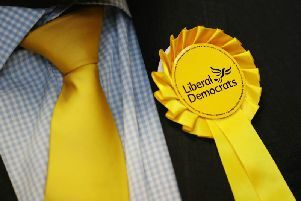 A Yorkshire parliament is among policies of the party, which is part of a European federation of pro-devolution groups. The Yorkshire Party set out its policies after the Conservatives held their manifesto launch in Halifax earlier and Labour launched its manifesto in Bradford on Tuesday. Speaking outside Wakefield Cathedral, Yorkshire Party leader Stewart Arnold said: “So in some ways we should be flattered that Yorkshire is getting all this attention. “But to me, this is not the real deal. The Yorkshire Party lists protection of greenbelt land, integrated health and social care and investment in infrastructure among its policies. Lucy Brown, the Wakefield Yorkshire Party candidate, said: “At the moment, what devolution offers is supremely dangerous for Wakefield being considered a suburb of Leeds. “Leeds is an excellent hub for retail and business. However, Wakefield has much more to offer than just trying to copy that.